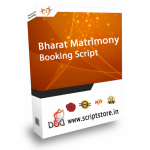 Matrimonial sites are popular in India and among Indians settled overseas. Our Bharat Matrimony Clone Script is one of the most powerful scripts to run a proficient matrimonial portal site. It provides an entire matrimonial solution for matrimonial agencies.